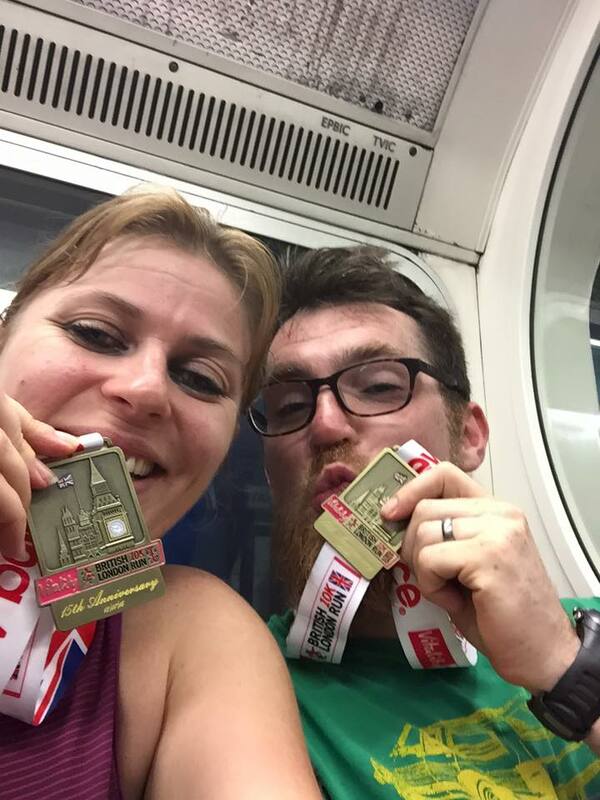 On Sunday 11th July, Mr Charming and I got up at 4am after attending a wedding the day before, to drive to London to run 10k. Runners. We do some crazy things! 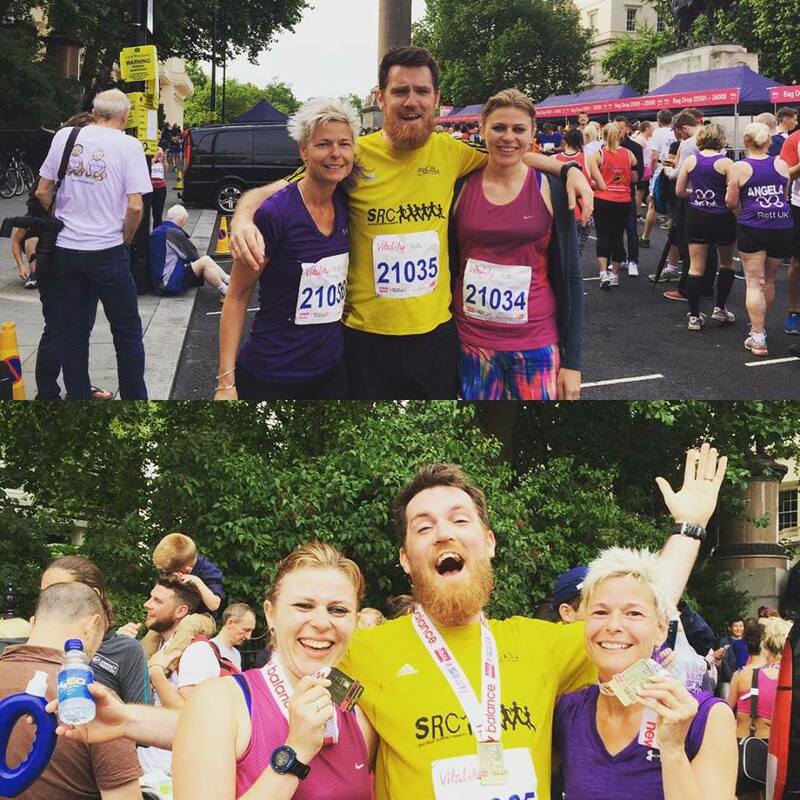 We were honoured to run for a brilliant charity called ABC Trust. Their primary purpose is to give under privileged Brazilian kids another way out, an alternative to guns and drugs and gangs. They instil community through art and sport, in a very tangible way. After parking in Westfield we met up with aces neighbours and running buds on the platform, and headed to Piccadilly Circus to drop bags and meet up with the rest of the crew. We actually arrived about 8am – 90 minutes before the start. Mr Charming even got some naptime on the pavement, which was lovely and warm from the previous day! As the start time inched closer, we were corralled down the steps and along the Mall. It felt like miles and miles – in reality, it probably wasn’t less than a mile. Quite a long warm up for a 10k! There were plenty of charity tops around, and we saw a few that we weren’t familiar with. To our dismay, we realised that there were no pens and we were heading towards the start in waves, where everyone was in the same place regardless of pace. It took more than thirty minutes to cross the line, and when we did, there were people who walked from the start, and people who were near their oxygen limit within 500metres. On the flipside, there were people who wanted to go much faster than that, penned in by the walkers in front. All in all, a stressful start for everyone. The route was turnarounds, which made the non penned start even more awkward as everyone slowed down for the 180 degree turns. It was a real shame because it takes you down Regent Street and Piccadilly Circus – closed roads – but you can’t focus on that because you’re too busy trying not to trip over people. The weather was lovely, not as warm as the day before and I was still hot in a vest and shorts, but it was really pleasant. The water stations were well stocked and regularly placed, but it was a bit chaotic (as they always are). The marshalls were great but I was disappointed that pedestrians were able to cross in front of the runners – this resulted in me colliding with at least two people who stepped out in front. Again, not exactly stress free. I had aimed for a steady pace and wanted a sub one hour 10k. We started off at 9:40 pace but happily, soon enough we were able to increase the speed and cruised at around 9min/miles (ish) for the next 5. I felt absolutely fine and even managed to put on a sprint for the last .2 of a mile, averaging 8:33min/mil and crossing the line with a chip time of 58:23 – well under the sub 60 target. I got to finish with a dear running buddy too, which was lovely. Mr Charming was just slightly behind us – one bonus of the turnarounds were that you could see who was behind you. We moved through the finish chute and were given a bottle of water. As we continued, I realised that the medals were not in sight. We were herded up the steps again and back into the baggage area, at which point I asked a runner with a medal where he’d got his from. He explained that they came back with the bags. My friend was dismayed at that – she didn’t have a bag. As we got to the top of the steps, it was a melee of thousands of people in a square, split between baggage tents and a massive queue for people who were just getting a medal. What a mess. Better than that, I managed to get to a baggage tent which was next to the one we dropped our bags off at. There were about thirty people between me and our tent, but no barrier for the people working inside. The chap I spoke to refused to give me my bag (about three foot away from him), so I had to work my way through everyone to pick it up. Again, a stressful end. For a race that’s more expensive than the London marathon (and a quarter of the distance), I expected slick organisation, an interesting route, penned start and more than a water bottle in the goody bag. Something to eat is always welcome, and I don’t even mind the vouchers and trial size products that seem to be the norm. At £50 per place, I don’t recommend this race.